280 pages | 15 B/W Illus. Home to approximately one-fifth of the world’s Muslim population, Indonesia and Malaysia are often overlooked or misrepresented in media discourses about Islam. Islam is a religion but there is also a popular culture, or popular cultures of Islam that are mass mediated, commercialized, pleasure-filled, humorous, and representative of large segments of society. During the last forty years, popular forms of Islam, targeted largely towards urbanized youth, have played a key role in the Islamisation of Indonesia and Malaysia. This book focuses on these forms and the accompanying practices of production, circulation, marketing, and consumption of Islam. Dispelling the notion that Islam is monolithic, militaristic, and primarily Middle Eastern, the book emphasizes its dynamic, contested, and performative nature in contemporary South East Asia. 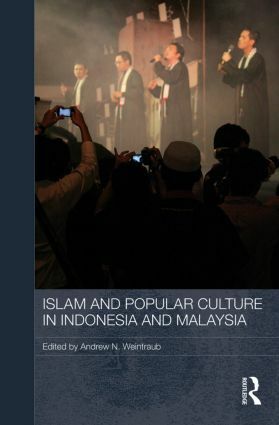 Written by leading scholars alongside media figures, such as Rhoma Irama and Ishadi SK, the case studies although not focused on theology per se, illuminate how Muslims (and non-Muslims) in Indonesia and Malaysia make sense of their lives within an increasingly pervasive culture of Islamic images, texts, film, songs, and narratives. Andrew N. Weintraub is Professor of Music at the University of Pittsburgh, USA. He is the author of Dangdut Stories: A Social and Musical History of Indonesia’s Most Popular Music; Power Plays: Wayang Golek Puppet Theater of West Java and co-editor of Music and Cultural Rights.